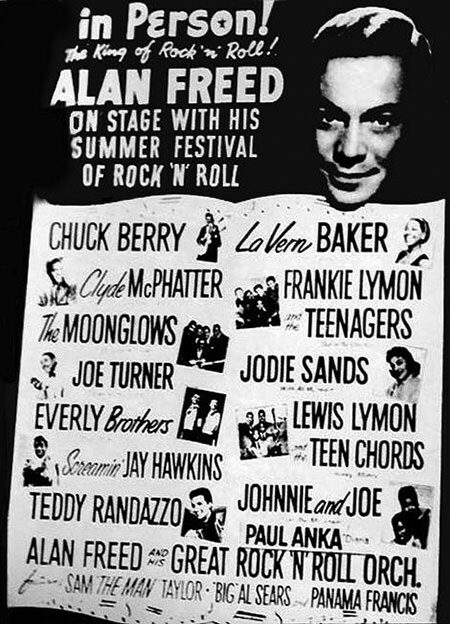 Hosted by Alan Freed who coined the term "Rock n roll", this radio program helped popularize rock on the airwaves. In 1956, Alan Freed was pretty much on top of the world. The so-called "father of rock'n'roll" was living in New York City, broadcasting primarily from WINS (1010 AM), and enjoying the fame (or notoriety) he had gained by organizing the "Moondog Coronation Ball" a few years earlier in Cleveland. He would also appear in two films that year, Rock Around the Clock and Rock, Rock, Rock, which would help to popularize the music that was making Freed so famous. 1952's Coronation Ball is widely remembered as "the first Rock and Roll concert", and it was also the event which helped to establish Freed's reputation as a trouble maker. Freed was credited with coining the term "rock and roll" for the new type of music while broadcasting his "Moondog House" DJ show on WJW. Although Rock and Roll musicians were relatively clean cut by today's standards, a riot nearly broke out at the sold-out event because more tickets were printed than there were seats in the Cleveland Arena. One of Freed's few low points during 1956 was a suit brought against him by New York street musician, Lois T. Hardin over the name Moondog. Hardin, who was blinded in a farming accident in the early 1930's at the age of 16, was a composer, musician, and beat poet. He had adopted the pen name Moondog in 1947 and composed an instrumental recording called "The Moondog Symphony" which Freed took as inspiration when naming his show. The New York Supreme Court found in favor of Hardin who had been using the name longer, and Freed had to pay damages. However, he could afford to pay because he had been tapped to host The Camel Rock and Roll Dance Party over WCBS. The music may be hard to recognize as rock and roll by modern youth, but there is no denying its appeal. The featured band for many of the broadcasts is the Count Basie Orchestra. Although Basie is usually associated with Big Band and Jazz music, he helps to underscore the fusion of elements that went into the early rock and roll sound. These recordings have been available to OTR collectors for some time as AFRTS rebroadcasts with the commercials removed. This collection prominently features Freed reminding us of the smooth pleasure of smoking great tasting Camel Cigarettes. Although we do not condone smoking and remind our listeners of the well-known health dangers of cigarettes, we do appreciate the significant contribution that tobacco company sponsorship had on commercial radio. Excellent collection of every show,sound quality is fantastic! I highly recommend this set to everyone that loves 50s rock & roll, AM radio, and Alan Freed, you can't go wrong adding this to your collection!